There were many British monarchs, some have the same name making them a nightmare to remember! This unusual Poem about the Kings and Queens of England is taught in English schools as an educational resource to provide children and students and overview of the names and important events of the Kings and Queens of England. This Poem about the Kings and Queens of England also provides the order in which each English King and Queen reigned. Click Short English Kings and Queens Poem for a much shorter poem used to remember the names and order of English Kings and Queens. By a shot from his friend, when hunting for sport. As Henry the first, of the great English nation. But no one pretends to say he had a right. With Becket, fair Rosamond and Queen Eleanor. But his life was cut short by a murderous hand. From whose hand, reluctant, Magna Charta was won. Then his son Henry third, deny it who can? Was full of perplexities, sorrows, and fears. Much respected and feared, in holding that station. 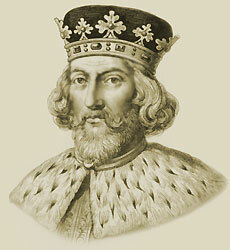 And his son Edward second, first Prince of that name. To their introduction has the right to lay claim. From Edward peculiar attentions were paid. To the region of darkness from whence none return. His crown and his sceptre were feebly retained. Of the fate of this maiden, it is all known too well. That he fancied Dame Shore, when wed to Bess Gray. Who from love, or ambition, are tempted to fall. Of youth, love, and beauty, and laid in the tomb. Though never permitted by his uncle to reign. Whose vices surpassing put others to shame. Lamented by none, but detested by all. The red and the white leaves all mingled in one. Mixed up with his Anne’s, his Katy’s and Jane. And greet with delight, the sixth Edward by name. When called to resign it and lay his crown down. On the throne of Great Britain,at least not as yet. Where pleasures eternal can have no alloy. Shall hunger, and thirst, and sorrow no more. And revisit the clime that gave Edward his birth. Notwithstanding reluctance, her Sceptre and Crown. Now called for his victim, and made her his own. But by painful sickness and loathsome decay. That her’s was a glorious and most prosperous reign. She managed with fitness to govern the nation. As a beauty to Venus, though crook’d and red haired. That in giving her hand, she gave away her power too. And for her lost Essex she deeply laments. I leave to some rhymer, more able to sing. In peace and security permitted to reign. And England and Scotland remain undivided. And continued to the end of the reign of Queen Ann. And in his place Oliver Cromwell we see. That this same Oliver was a very great man. In eleven years the days of the Commonwealth ended. And gay Charles the second, the throne then ascended. For many a fair one he seems t’ have enthrall’d. Over the channel to France, where he dies. Through right of his wife, Princess Mary by name. Are crowned King and Queen of England for life. As a wife most devoted, a friend ever kind. And it covers the space of thirteen full years. But firm on their ruins, the House of Hanover rose. And four in succession we count up as Kings. Was for virtues and goodness of heart much extolled. Bearing title of king for sixty-two years. Bereft of his senses and hearing, and blind. And independent of rulers over the sea. To make way for his eldest and libertine son. As a husband and father he never was fit. In the spring time of life, scarce with warning cut down. Let bitter tears fall, as they gazed on her urn. The heart-stricken husband apart and alone. For his loved one, his dearest, lies low with the dead. When a wife, and a son, and a kingdom he lost. For between him and his brother two deaths intervene. A long, peaceful reign, an old age of repose. Some interesting facts and information about the History, Life & Times of Kings and Queens of England in a Poem. Additional useful details, facts, history, biography, timeline and information about the lives of all of the Medieval Kings of England and the important events which occurred during their times, can be accessed via the Medieval Life and Times Sitemap. The content of this article on Medieval life and times provides free educational details, facts and information for reference and research for schools, colleges and homework for history courses and history coursework.